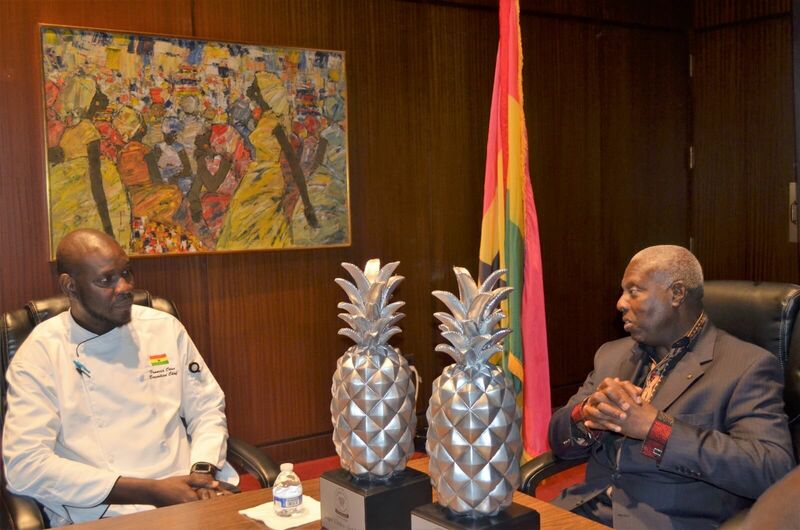 Executive Chef Francis Otoo has presented his double-silver trophies won at the 10th-anniversary edition of the annual Embassy Chef Challenge to Ambassador Barfour Adjei-Barwuah, Ghana’s Ambassador to the United States. 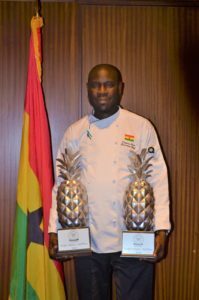 Chef Francis Otoo made the presentation at the Embassy of Ghana in Washington, DC, barely a week after he won second-place prizes in the categories of the jury and public choices awards for cooking lamb Jollof as he represented Ghana at the Embassy Chef Challenge on May 17, 2018. This year’s event was the fifth time the Chef represented Ghana at the culinary competition. A letter of appreciation from the embassy signed by the Ambassador in part read, “We wish you every success in all your endeavors and pray for the good Lord’s continuous blessing on you and your family.” Chef Otoo said to TheAfricanDream.net that the letter was indeed a pleasant surprise. Both the Judges’ Choice and People’s Choice first place awards at this year’s Embassy Chef Challenge was won by Chef Sincioco-Mateo of the Embassy of the Philippines in Washington, DC, but Chef Otoo’s second place awards ensured that Africa was well represented on the medals table. Find the multi-award-winning US-based Ghanaian Chef on Twitter as @cheffrancisotoo to catch up with what’s latest with him, he is also on Facebook by his name.